South Asia Hand » Blog Archive » The Kashmir Interlocutors Report – But Who Will Listen? The Kashmir Interlocutors Report – But Who Will Listen? June 1, 2012: In the summer of 2010, riots of youth throwing stones and calling for “azadi” – freedom from Indian rule – convulsed the Valley of Kashmir. Prime Minister Manmohan Singh pleaded eloquently to “give peace a chance,” and appointed a panel of three “Interlocutors” to assess public opinion in the state and make recommendations to resolve its seemingly intractable problems. On May 24, the Indian government finally released the report the panel had submitted to it seven months earlier. The long delay suggests that the report, despite the good sense in many of its recommendations, will join a long list of missed opportunities to transform political relations between New Delhi and Srinagar. Like so many initiatives the Indian government has taken on Kashmir, the appointment of the interlocutors was a reaction to unexpected events that undercut the complacency Indian authorities and the Indian public experience during deceptively quiet times in the Valley. To their credit, the interlocutors’ long list of recommendations reflected their conclusion – which we share – that amelioration of Kashmir’s situation must involve devolution of power from New Delhi to state and local bodies, a more porous Line of Control between the Indian and Pakistani controlled parts of the state, and increased cooperation between those two areas. The report has been sharply criticized by both Hindu nationalists led by the BJP and by Kashmiri separatists, and neither the government of India nor the Kashmir state government has endorsed it. However sensible many of the proposals may be, the prospect that any significant number of them will be enacted is at best limited. The panel was an odd trio comprising a leading journalist, a prominent academic figure, and a former government official. It included no politically powerful leaders able to mobilize public support for its eventual findings. This, and its occasional public infighting, undermined its standing as a body whose conclusions should be taken seriously. The interlocutors carried out their work conscientiously. They interviewed thousands of Kashmiris all over the Indian-controlled parts of the state, held public round-table discussions, and met with civil and military leaders. Although they were handicapped by the refusal of prominent separatists to meet formally with them, they did manage some informal contact. They could not, of course, sound out opinion in Pakistan-held areas. These were off-limits to them. Nor did their mandate include any invitation to make recommendations on how to engage the Pakistan government in bringing about a Kashmir settlement. 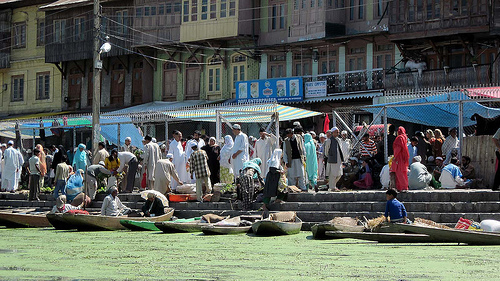 In dealing with what they recognized as their most crucial issue– how to reconcile alienated Kashmiris with their political connection with India — the interlocutors rejected as impractical the familiar demand for a restoration of the federal-state division of power as it existed in 1952, before Kashmir’s special status was repeatedly eroded. Instead, they called for the creation of a committee of constitutional experts to recommend which of the central government measures that had been extended to the state in the subsequent six decades should be retained. The panel held that in future the Indian parliament should make no laws applicable to the state unless they related to the country’s internal and external security and its vital economic interests, especially in the areas of energy and access to water resources. It called for the permanent retention of Article 370 of the Indian Constitution, which gives Kashmir special status. The panel’s recommendations for the devolution of power to sub-state levels include the establishment of elected regional councils for the three distinct parts of the state – the overwhelmingly Muslim Kashmir Valley, predominantly Hindu Jammu, and mixed Buddhist/Shia Ladakh — and the creation of elected representative bodies at the district and village levels. The panel proposed that the package of measures adopted by consensus by the constitutional committee be made a part of the Indian constitution by the standard procedure for amending the constitution, involving acceptance by both parliament and the legislatures of the Indian states. Aside from these formal changes, the interlocutors called for a variety of confidence building measures. The most important of these is the amendment of the harsh and unpopular legal provisions that give unaccountable power to the Indian Army in much of the Valley. They also include a call for the return of the Kashmiri Pandit community, exiled from their Valley homeland since 1991. Although the report is focused on proposals to change the way Indian Kashmir is governed, it also calls for a “hassle-free” movement of people, goods, and services across the Line of Control that separates the Indian and Pakistani-administered parts of the state. In addition, it advocates “institutionalized cooperation between the two parts of the erstwhile princely state in all areas of mutual interest and concern.” It declares that promoting major cooperation between the two sides of Kashmir will require “substantial constitutional changes” on the Pakistan side. But this issue is beyond the interlocutors’ mandate and they offer no ideas about how these changes should be brought about. Indian Home Minister P. Chidambaram, to whom the interlocutors reported, told the media on May 30 that the government had not yet considered the report. He said he hoped that there would be a “structured debate” and that “in the next couple of months there will be a few workshops around the country where the interlocutors will be available as resource persons.” Chidambaram’s tepid statement, which followed his ministry’s letting the report gather dust for seven months, is hardly encouraging. Increasing evidence of the weakness of the Manmohan Singh government and its growing inclination to steer clear of controversial matters (or to capitulate on them) strengthens our impression that the government is unlikely to move on the issue in any significant way. What seems most likely is that the report will be largely ignored at least as long as the Kashmir scene remains relatively calm and India-Pakistan relations are improving. Perhaps reflecting that improvement, neither the Pakistan government nor the Pakistani media have paid much attention to the report. In more difficult times they would have loudly condemned it as unacceptable. But that is the way successive Indian government have dealt with the problems of the state. It would be a very pleasant surprise if things turned out differently this time around. The interlocutors report attracted criticism from all sides. It is purely an academic exercise which qualifies for the award of PhD. It is quite surprising that the Indian government refused to own the report of its own established committee. It is quite clear that India has no Kashmir policy. Musharraf’s four point formula was a desirable and practicable approach but India’s lukewarm response dissolved the whole effort. The Indian Prime Ministers working groups established in 2006 have put forward almost similar recommendations as the interlocutors report highlights. There was not need of wasting money on the enterprise of interlocution. What actually matters is sincerity on the part of Indian govt. to address the issue of Kashmir.